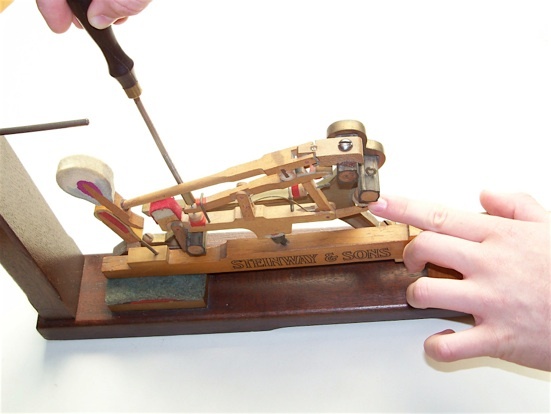 Napoleon Erlandsen and his son, Julius, are well recognized by tool collectors and historians for their hand planes and bow drills, but it is not as well known that they manufactured many of the more specialized tools for servicing and manufacturing pianos. 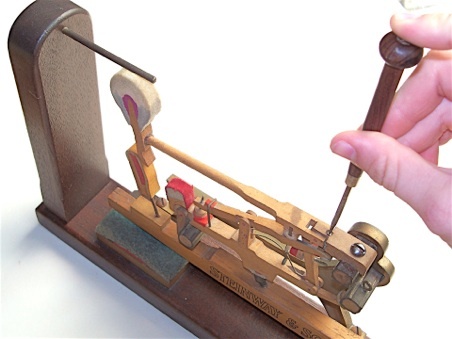 These tools were commonly rebadged as Hammacher Schlemmer piano tools. Erlandsen made a full line of regulating tools. 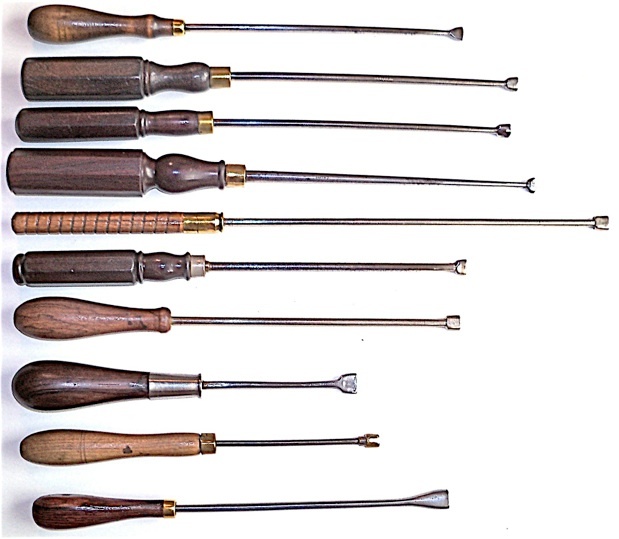 Various let off screwdrivers: Top to bottom: Hammacher Schlemmer and Co., New York, top three; C. H. Lang, Chicago; Hale, Boston; The remainder, below, are unmarked. 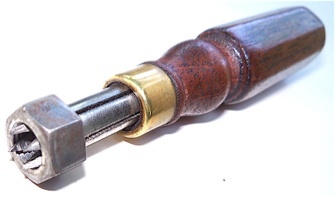 Part of the charm of these old tools is their handles, which are mostly rosewood, with attractive turnings. These handles represent a wide variety of user preferences. A discussion of handle matching can be found on the Combination Handles page. H.S. & Co. German silver ferrule. The socket greatly affects the way these let-off tools perform, and with these antiques, there is considerable variation. Very old 19th century driver, shown at the bottom of in the large photo above, revealing wear in socket. Socket opened up, allowing for driving at greater angles. Very narrow opening; tool must be used straight up and down or regulation eyelet will be bent or broken off! Most tuners improvised some of their tools (just like today). 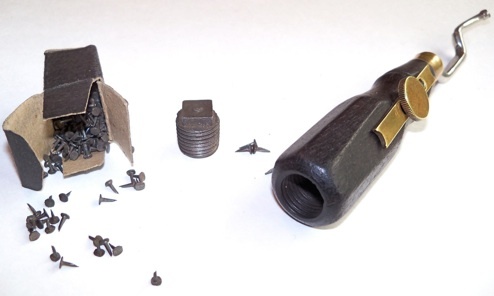 Both of these tools used a screw as their basis: a slotted drop screw adjuster, and a short let off tool that is simply a screw with a deepened slot that allowed for use at various angles. Screwdrivers found in piano kits. An advantage of having individual handles for these tools is that the size and shape of the handle can be chosen for a particular function or intended use, not unlike the mating of an appropriately sized handle for a particular chisel. Individual preference also entered into this. 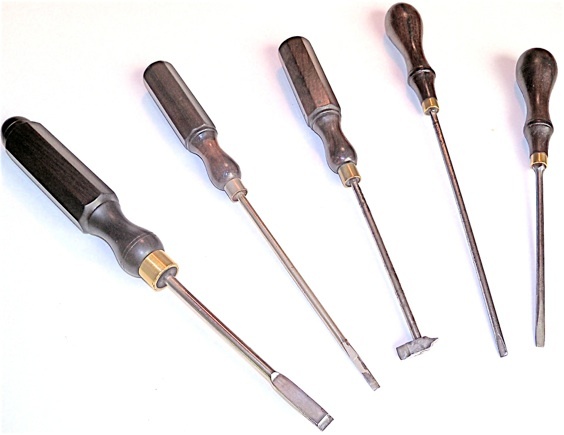 Hollow ground flange screw driver; Three narrow action screwdrivers, and one offset driver for rocker capstans, and other hard to access places. 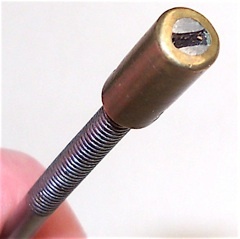 Drop adjustment screw (or upstop for balancier). Balancier height adjustment screw. Thanks to my son Jeremy Shepherd for the extra pair of hands in these demonstrations. 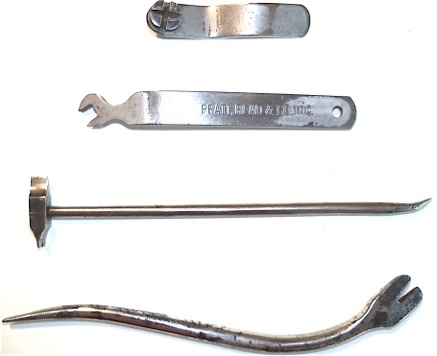 Drop screw, balancier, and jack adjustment tools. The handles are smaller than they might appear in this photo. 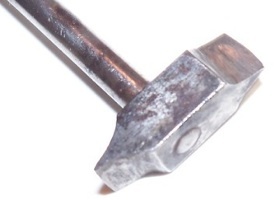 Same tool, H. S. and Co.
Close-up of an old drop adjusting tool. Cutting a slot in the shaft and placing a sleeve over it, was a common method for creating the small slot socket. Small screwdrivers found in piano kits for slotted drop screws. 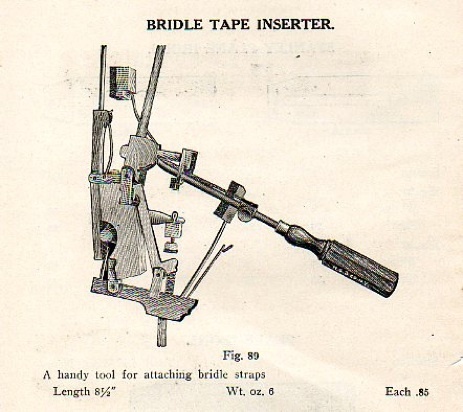 Bridal tape/tack inserter. Schley 1905. Tuck Mfg. 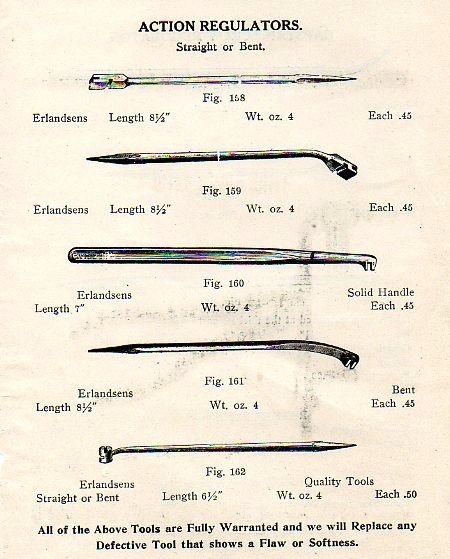 Co., Brockton, MA, provided at least some of the rosewood handles for the tools shown here and in the catalogs. 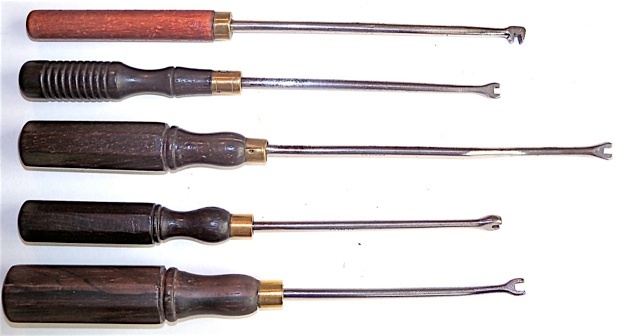 In my opinion, these handles, used for piano regulating and repairing, and other tools too, were some of the finest available in the United States in the late nineteenth and early twentieth centuries. 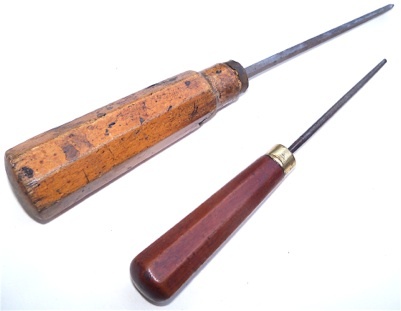 The shape shown below is a slight variation on the London pattern handle, and most of the other regulating tool handles, without the round section at the end, are known as common octagon handles. Examples of two tapered octagonal handles, which is an older handle shape, going back to the 17th and 18th centuries. 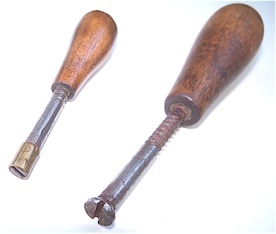 Ferrules were added later, in the 19th century, and these were often used for chisels. At the top of the photo is a reamer, slightly larger reamers are used for reaming the bored holes in the grand hammer moulding, to refine the fit of the shank in the hammer moulding before gluing and hanging. 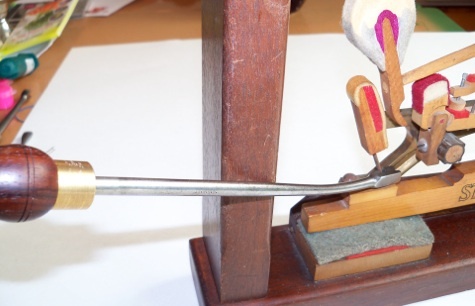 The small tool with a rosewood handle is a small rat tail file that was found in a piano kit, probably used to slightly enlarge the balance holes in keys where the balance rail pins were binding. Hammershank reducer. Another method of refining the fit of new hammers onto shanks. Backcheck wire adjustment, for demonstration purposes. Normally, wire-bending pliers are used for grand backchecks. Action wire benders. Top, H. S.; unmarked; H. S.; and bottom, Erlandsen. Spacing keys by bending the front rail pin slightly. Key-spacing tools. Top: unmarked, and heavily constructed; American Felt Co. (? ); and H. S. and Co. The tool at bottom is not bent, it’s just a distortion by the camera lens. H. S. 1925 catalogue. It’s identical to the example above as well as the Erlandsen key spacer included in the catalogue illustrations at the top of this page. 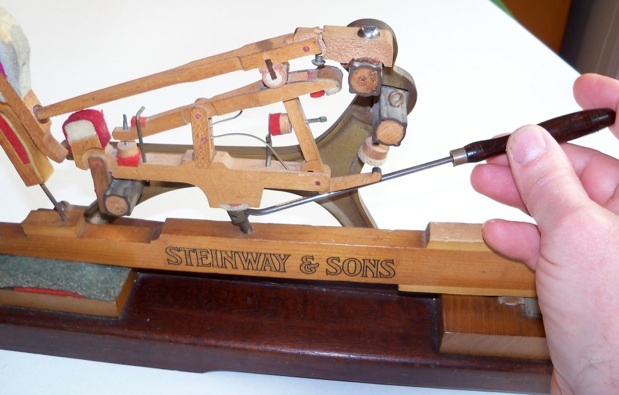 Capstan adjustment, and a closer view of the Steinway and Sons Centenary action model #37, c. 1953. Lyon and Healy (music merchants and harp makers, Chicago). 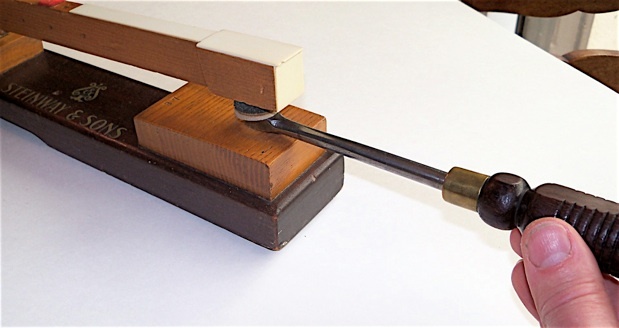 This tool, with an angled slot, was used to adjust very small, square shoulder-type capstan screws. Two butterfly repetition spring adjusters, from Steinway, New York. 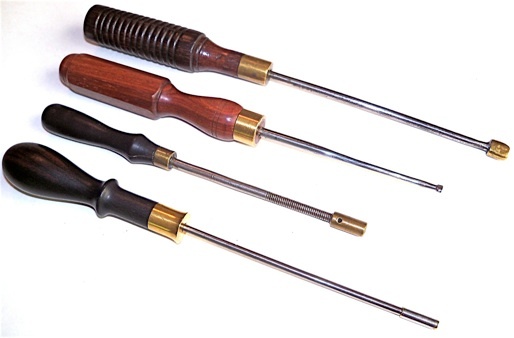 Damper wire adjusting tools, although sometimes listed in the old catalogs as backcheck tools. Top two are unmarked; bottom three were sold by Hammacher Schlemmer. The tool at the top has a handle made from a maple dowel, stained and varnished, probably from the 1920s. 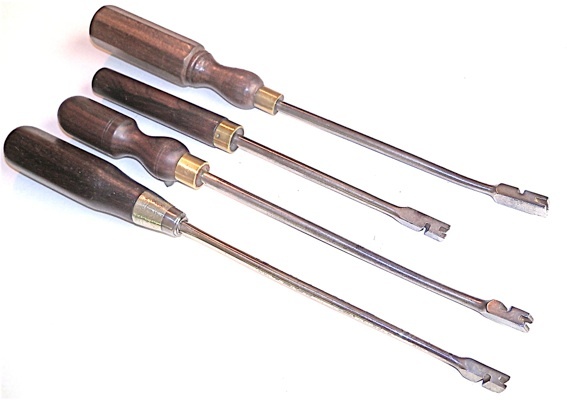 By this time, production of these tools with increasingly costly and space-consuming rosewood octagon handles became less of a standard practice, and by the 1930s, most regulating tools were sold with a specialized base made to be fastened into the socket of the combination regulating handle. Tools in the middle and bottom have an offset shaft. Upright spoon benders, to adjust damper timing to the key stroke. This is done blindly, and takes some practice to acquire a ‘feel’ for the damper spoons at the back of the action wippens. Top: unmarked, nickel plated, with a London pattern rosewood handle; Trefz Co, with a twist, intended for use without a handle. ; H. S. and Co. (Erlandsen). Damper head wrench, sometimes associated with upright overdamper actions, known as “birdcage actions” in North America. Today, straightening up damper heads before felt installation would be typically done with parallel pliers. 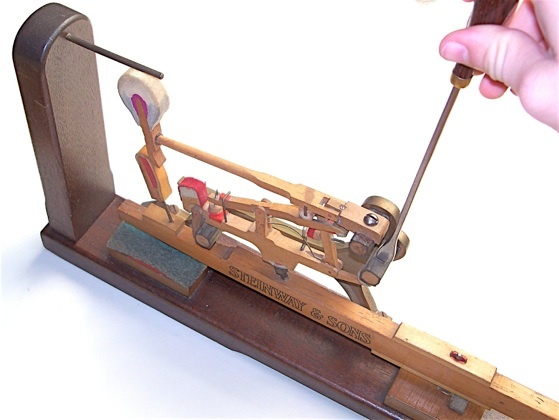 This tool still remains in the Renner (Stuttgart) piano supply catalog. Damper head wrench, close up.